Fancy means fancy in cloth and cut. All DB waistcoats are by modern standards fancy waistcoats. Anything other than a plain SB W-C is fancy. I quite like fancy waistcoat no1. Not only can one see the twin points at the bottom echoing the cuttaway angles of a morning coat, but it also has a more modern feel to me. The way the doublebreast is pulled across with a single unaltered diagonal line but fails to meet in a single point at the bottom, recalls to my mind some of the deconstructionist elements I've seen in some of the latest architecture. Walls over laping edges and cut at angles. Still funtional, but with more carefree zest than the perfectly met right angle. Interests:Formalwear and the finer points of looking sharp. After some long thought, I believe that I will be going a different direction on the coloring of the waistcoat. I was watching a documentary about American music, and it showed a clip of Fred Astaire in "Easter Parade". In this scene, he is wearing a white waistcoat with his morning dress. I really liked the crispness of its appearance. Additionally, this seemed very unique in that I've only been able to find a handful of pictures of morning dress with white waistcoats (Astaire in "Easter Parade" and "Swing Time", I haven't been able to find any others, even of other people). This is a very special occassion in my life, and I want to wear something special. I will probably do it in linen. I am curious as to what people think of this look. Have you seen it before? Would linen with mother of pearl buttons be a good choice in materials? As always, just looking for feedback. Just because it looks good in my eyes, doesn't mean it will look good. I suggest going for a slightly off-white - light cream colours or oyster. Plain white can look a touch harsh, which is magnified by daylight. These colours tend to bleach a lighter complexion and are best suited to someone with darker hair and darker complexions. Linen is fine, but I would also suggest looking at the cream coloured design in the New Fine Worsted range from Dugdale. After some long thought, I believe that I will be going a different direction on the coloring of the waistcoat. I was watching a documentary about American music, and it showed a clip of Fred Astaire in "Easter Parade". In this scene, he is wearing a white waistcoat with his morning dress. I really liked the crispness of its appearance. Additionally, this seemed very unique in that I've only been able to find a handful of pictures of morning dress with white waistcoats (Astaire in "Easter Parade" and "Swing Time", I haven't been able to find any others, even of other people). I don't think Astaire's waistcoat in swing time was a true white, I believe it just appeared that way under the bright lights. Certainly not white, or even cream for that matter. Edit: * actually Sator's mention of Oyster sounds spot on. Edited by Artist's Eye, 19 February 2010 - 05:05 PM. Thank you to both Sator and Artist's Eye. I do believe that true white will be much too harsh and would not look good. Here is a layout of my plans and I'd like to see what people think. First, I like the idea of cream, oyster and calico. For the potential color, I think that Pakeman Catto and Carter’s D/B Linen Waistcoat-Calico is good a good example. It will probably be linen as well. 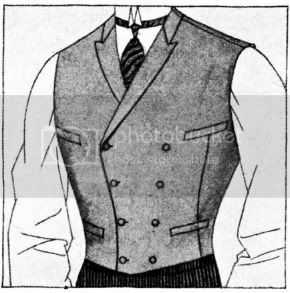 As for cut of the waistcoat, I am planning for it to be double-breasted with six buttons (3x2), four pockets, and a basque waistline. This waistline is one of the details I seem to keep coming back to. I really like this appearance compared to a straight cut. I feel that peaked lapel will be better fitted for this waistcoat than sash lapels. I might be wrong on this though. I found these images at The Fedora Lounge that represent the cut well. I think that this image Sator posted at Ask Andy last year really displays the overall look I am going for, including the cut on the waistcoat and and the addition of spats. This is an example of what the color combination may look like. As always, I'd love to hear what people think. When I finally finish this project, I will need to be posting pictures. The DB W-C is a style that can quickly look baroque or bizarre if not executed well. This one looks OK. I am still not fond of the excessively bellied lapels and the way the collar is style at the gorge, but that may be a matter of taste. A lot of tailors won't know how to execute a cut on lapel anymore. The DB cut, bellied lapels and a lack of strong point at the bottom front all conspire to make the wearer look a bit portly. 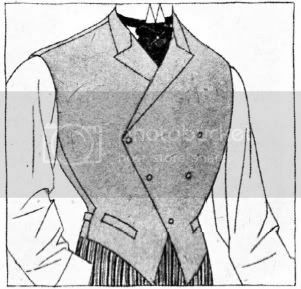 The waistcoat looks far too long for the proportions of the wearer. It only emphasises the length of the torso, and makes him look like a boa constrictor. The lack of any V shape to the buttons exacerbates this. This is piece of artwork, nothing wrong with that. Be nice to have the whole picture. The image of the person in the top hat with the really bad waistcoat was mainly posted for showing how I think the colors may work. I have no interest in that waistcoat, I think it is horrible. Charles, any chance you could post a picture of it being worn in a similar pose as the one I posted above? I'd love to see a comparison. I do think yours is more of what I'm looking for in style. You appear to have a much more defined point in the hemline. The one Charles looks better to me because the lapels have less belly, the style of the collar is less affected, and the bottom has a more clearly defined point. There is a sufficient V formed by the buttons. I think the biggest problem is that the buttons are lined up parallel. However, the wearer is quite slender and lanky already. The DB buttoning should be in a V shape to give his body shape the illusion of a more athletic build. It's unnecessary to elongate out his build. In doing more research on morning dress, and wedding fashion in particular, I read portions of Emily Post’s Etiquette in Society, in Business, in Politics and at Home (published New York: Funk & Wagnalls Company, 1922). This book is quite informative for what was “proper” in America at the time. I am unsure how much of this applied to other parts of the world. The reason I mention this, is that she mentions the use of a “white piqué double-breasted waistcoat”. 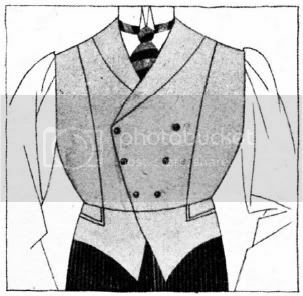 It is good to know that my intention for wearing a white double-breasted waistcoat was considered “proper” or “the norm” at one point. Though I had never heard of a piqué waistcoat with daywear. If he does not already possess a well fitting morning coat (often called a cutaway) he must order one for his wedding. The frock coat is out of fashion at the moment. He must also have dark striped gray trousers. At many smart weddings, especially in the spring, a groom (also his best man) wears a white piqué high double-breasted waistcoat, because the more white that can be got into an otherwise sombre costume the more wedding-like it looks; conventionally he wears a black one to match his coat, like the ushers. The white edge to a black waistcoat is not, at present, very good form. Formal afternoon dress consists of a black cutaway coat with white piqué or black cloth waistcoat, and gray-and-black striped trousers. What are your thoughts on using piqué for a waistcoat with morning dress? In those days they even wore patent leather boots with their morning attire. Pique waistcoats are likewise a bit of an anachronism. The other trouble is finding pique heavy enough that you could make up into a waistcoat. The only source I know of is Thomas Mason Silverline. They don't sell cut lengths and have a minimum order of 100m! Nor will they sell to just anyone anyway. Rules do change, which means some rules aren't overall rules, but are within time zones or a certain classification, and so on. I think the person selected different rules from different times and married them together pretty well, except the tie. Taking piano lessons one time, a billion years ago, the teacher was showing me the math. When I started taking to much interest he stop telling the math and said to go by hearing. Math in itself is not music (math is a bunch of rules), and music is the art of sound. Sometimes the math points out the art instantaneously. But, sometimes we don't understand or even see all the math (much more even know their is maybe math, and is there always math?) so we go by sight, feel, sound and whatever else to determine what is art and use other rules to separate this art from that art. Sator, so the short of it is that patent leather is definitely out, and I should steer clear of a pique waistcoat. Something in white/cream/off-white/oyster is still acceptable. Going that route, linen would be acceptable, but I should definitely check out the finer worsted wools. I truly thank you for your input on this. trouble is finding pique heavy enough that you could make up into a waistcoat. I've studied several pique waistcoats from the turn of the century to 1920's and my local fabric shop has it. it's not quite as heavy as you would imagine. I've asked Alumo for some pique cotton, saying it is to make a waistcoat of, and they showed me some which seemed OK to me. I've not given it a try yet, but is seems as sturdy as linen, and I do not see why is could not be used for waistcoat. Weight range is 125g -> 200g /m, the last one feels much heavier than 300g linen. The reason why piqué was used as a waistcoating also had practical reasons. Wool could not be woven in tropical weight as it can be today, so you were forced to use cotton (or linen). The reason for the popularity of piqué was mainly because it could soak up more starch to give you light yet crisp looking waistcoat. The piqué from Thomas Mason Silverline that I liked was pre-starched. This ought to make it easier to work with as a tailoring cloth.